The law of conservation of mass states that no atoms are lost or made during a chemical reaction so the mass of the products equals the mass of the reactants. This means that chemical reactions can be represented by symbol equations which are balanced in terms of the numbers of atoms of each element involved on both sides of the equation. Substances can enter or exit a non-enclosed system. These systems are often open flasks, or crucibles, that let gases enter or exit. If a gas escapes, it can look like the total mass has decreased. If a gas is added, the total mass will look as if it has increased. However, the total mass stays the same if the mass of the gas is included in calculations. This is the average relative mass of the atoms of different isotopes in an element. It is the number of times heavier an atom is than one-twelfth of a carbon-12 atom. An atom’s mass number is the sum of its protons and neutrons. Carbon has 6 neutrons and 6 protons so we say it has a mass of 12. You can find this information on a Periodic Table. However, relative atomic mass takes into account that some elements have isotopes. These are atoms of the same element, but with different numbers of neutrons. The Periodic Table contains a list of every element, with their relative atomic masses. We can take an average of all an element's isotope mass numbers to work out the relative atomic mass of that element for ourselves (see diagram). masses of the reactants in the quantities shown equals the sum of the relative formula masses of the products in the quantities shown. Whenever a measurement is made there is always some uncertainty about the result obtained. For example, it may be difficult to judge what the temperature reading on a thermometer may be, or whether a reaction has actually finished or not. The resolution of a measuring instrument is the smallest change in a quantity that gives a change in the reading that can be seen. For example, a thermometer has a mark at every 1°C so has a resolution of 1°C. The uncertainty of a measuring instrument is given as plus or minus (±) half the resolution. So for a thermometer with a mark at every 1°C, the uncertainty is ±0.5°C. For a set of repeat measurements, the uncertainty is ± half the range. So for a set of results where volume was measured to be: 24.0 ml, 24.5 ml, 23.5 ml, 25.0 ml, 23.0 ml - the range is 25.0 - 23.0 = 2.0 ml. Half the range is 1.0 ml, so the uncertainty is ±1.0 ml. Chemical amounts are measured in moles (symbol: mol). The mass of one mole of substance in grams is equal to the substance’s RAM/RFM. One mole of a substance contains the same number of particles, atoms, molecules or ions as one mole of any other substance. The number of atoms, molecules or ions in a mole of a given substance is the Avogadro constant. The value of the Avogadro constant is 6.02×10²³ per mole. This means that for every one mole of substance (no matter the substance), it will always contain 6.02×10²³ particles. We can use this equation to calculate the number of moles of a chemical in a given amount of mass. Calculate the number of moles of oxygen needed to make 6 moles of magnesium oxide. Calculate the number of moles of magnesium oxide created, when 12 g of magnesium is burned in air. Reactions stop when one of the reactants is used up. This is because the other reactant has nothing more to react with, and so some of it will be left over. The substance that runs out is called the limiting reactant. The one left over we say has been added in excess. The stoichiometry of a reaction is the ratio of the amounts of each substance in the balanced equation. It can be worked out using masses found by experiment. A solution is formed when a solute dissolves in a solvent. 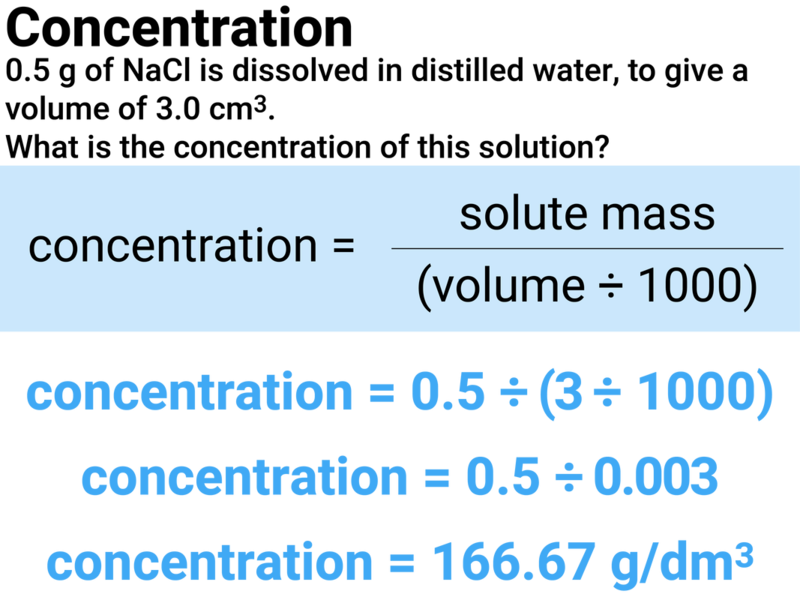 The concentration of a solution is a measure of the mass, or amount of solute, dissolved in a given volume of solvent. The more concentrated the solution, the more particles it contains in a given volume. The units for concentration are g/dm3, but they may also be written as gdm-3 - don't worry as these mean the same thing. Sometimes volumes can be quoted in ml, rather than cm3. These units describe the same volume. For example, 250 ml = 250 cm3. If your volume is given in cm3, then you will need to convert it into dm3 before it can be used in this calculation. You can calculate the formulae of simple compounds from reacting masses or percentage composition. These formula are called empirical formulae. 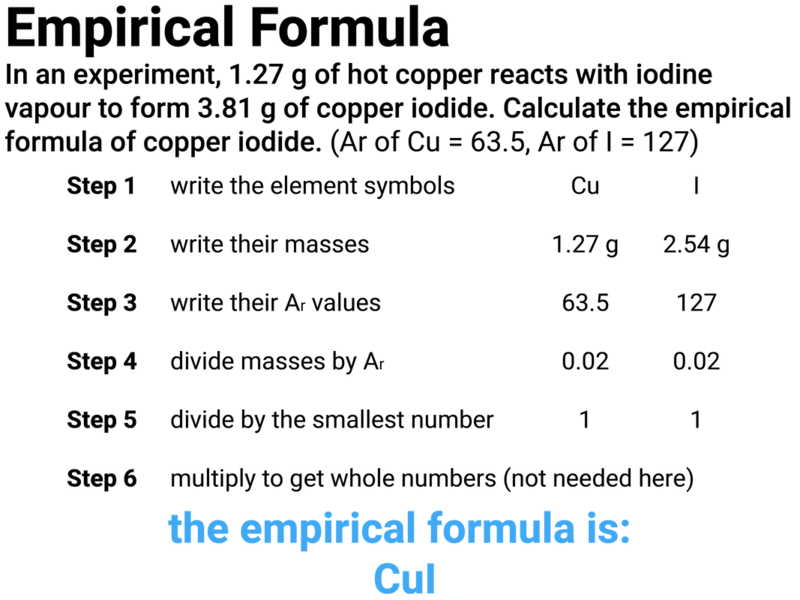 An empirical formula is the simplest whole number ratio of atoms in a substance. This shows that magnesium and oxygen are in a 1:1 ratio, so the empirical formula is MgO (for every 1 Mg, there is 1 O).